Need something to fill up your colorful Easter eggs besides jelly beans and melting chocolate? 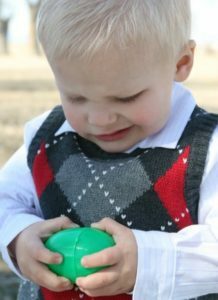 Consider the memorably educational fun of a “resurrection egg” hunt. You may have kids hunt for the eggs or simply present them in a carton, but here are a dozen possible ideas for stuffing eggs with true symbols of Easter. Note: some of these require a little more imagination or are subject to multiple interpretation, but hopefully still get the point across. Crackers… Jesus broke bread while sharing the Last Supper with His disciples. Coins… Judas did a very bad thing and betrayed Jesus for just a few coins. When Judas, who had betrayed him, saw that Jesus was condemned, he was seized with remorse and returned the thirty pieces of silver to the chief priests and the elders. “Rope” (yarn)… After they brought Him to trial, Jesus was whipped with a big rope. Cloth (Felt)… The bad people teased Jesus and put a robe on Him after beating Him up. Thorns… Because Jesus said He was a king, they took sharp thorns and made a crown. Cross… Jesus was killed on a big cross, which hurt more than anything possible. Vinegar “sponge” (cotton ball with vinegar)… While Jesus was on the cross, He got very thirsty, and they sent up a sponge of vinegar. Spices (Cloves)… When Jesus was buried, they put spices on His body to preserve it, sort of like a mummy. Rock (stone)… When Jesus was buried, a large stone was placed over His tomb so that nobody could come and take His body. LOVE IT ! THIS IS GREAT FOR VBS . Tony Kummer (Editor) reviewed & updated this page on : April 8, 2019 at 11:15 am. All our content is peer reviewed by our readers, simply leave a comment on any post suggest an update.